This guidance is intended for all clinicians, especially those providing pharmacological interventions for drug misusers as a component of drug misuse treatment. 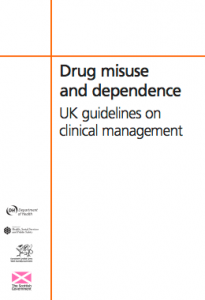 It updates and replaces ‘Drug Misuse & Dependence – Guidelines on Clinical Management’ (Department of Health, 1999), commonly called the ‘Orange Book’. This guidance build on the previous evidence-based and well-established Clinical Guidelines but reflect some of the considerable changes that have occurred in drug treatment over the past eight years. It is based on current evidence and professional consensus on how to provide drug treatment for the majority of patients, in most instances. The guidance supports the individual responsibility of clinicians to make appropriate decisions in the circumstances of the individual patient, in consultation with the patient (and guardians and carers if appropriate). In instances where clinicians operate outside the framework of this guidance, they should be able to demonstrate the rationale for their decisions.